Dysphagia, Cognition, Medical SLP, Aphasia, 2 clinic clients (4 sessions a week total), and one in-home ABA client that I see twice a week. Oyi. The good news for you, however, is that I will be making, using, and tweaking materials in my sleep quite frequently, so that means a lot more blogging! Disclaimer: I own more materials than any grad student should own. I recognize that, I claim it, and it is a whole lot of fun! Here’s my stash! This was supposed to be a laundry closet (as evidenced by the hookups you can see in the top left picture) but since I was only living in this town for a year and a half , I was not about to buy a washer and dryer and then move it back across the state. But don’t worry, I do have clean clothes! Yes, it’s a lot. Yes, I could run my own materials room in the event of some major crisis at school. But my favorite part of it all is that with very few exceptions, I didn’t pay full price (or anything, in some cases!) for the materials in this closet. Honest. Here’s how! My boyfriends’ mother is a librarian, and frequently sees lots of children’s books that don’t get put on the shelves. She will collect ones that look interesting, and every once in awhile call me up with a box of things to look through…for free! While not everyone has this great connection, many libraries do “quarter sales” where many books and puzzles can often be picked up for, well, quarters! Know any teachers? Books and other items they are cycling out of their classrooms are often great to look through. One of my favorite stores, ever, is Once Upon a Child. They are owned by the same company as Plato’s Closet and Clothes Mentor, who buy and sell gently-used name brand clothing. Once Upon a Child does the exact same thing for children, but did you know they also have toys and books?! And not only do they have toys and books, but they have them for unbelievable prices. I have found some brand new or very much like new toys and books for very minimal. They are quite picky about the quality of the items that they sell, which can make selling your used items to them tricky, but the great thing is that they sell quality. Check out their website and find one near you-it’s worth your time and then some! I have also found wonderful items at my local Goodwill-I have found better quality and a wider selection around bigger cities, but often these things can be found anywhere! The only downside to shopping gently used second hand is that you must be patient (which I am not sometimes!). Some days are great and you can find all kinds of wonderful gems, and others not so much. But you must keep looking! I wasn’t paid by either of these companies to mention them, I really just love them that much. Do I need to add this one? Well, I will. As I’ve mentioned before, I don’t think I could be half as creative as I am without this great site. Not only do I use lots of materials from here, but it sparks my imagination and gets me in a “I can do that! But what if I did it this way….” type of mindset. 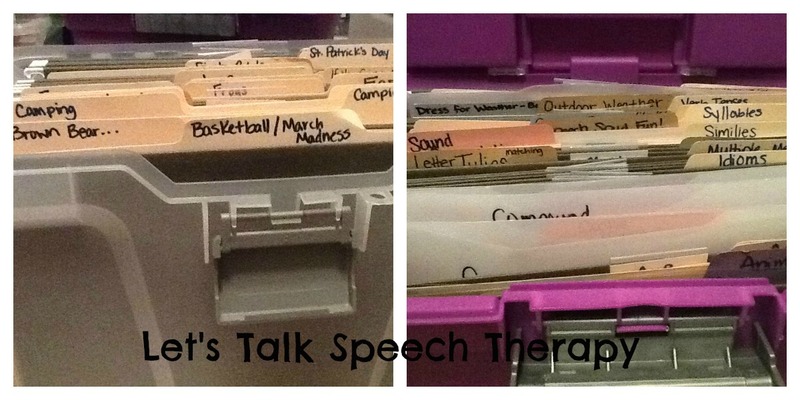 With a school printing budget, printing out materials, file folder games, and cards is simple. Some you do have to pay for (and are totally worth it), but there are a lot of great freebies out there, too! So, in short (or not so short), these are my favorite material collection methods,on a budget. And believe you me, if I can do it, you can too. What’s your go-to materials collection method? Hello! Summer is officially here-all 7 days of it! Summer classes ended well, and now I can finally get to all of the things I’ve had on my to-do list that aren’t school related. It’s been a cool rainy day (which is a huge rarity in Southern Indiana! ), so what better to do than to throw on some comfies, order take out, turn on some good Netflix, and get crafting. 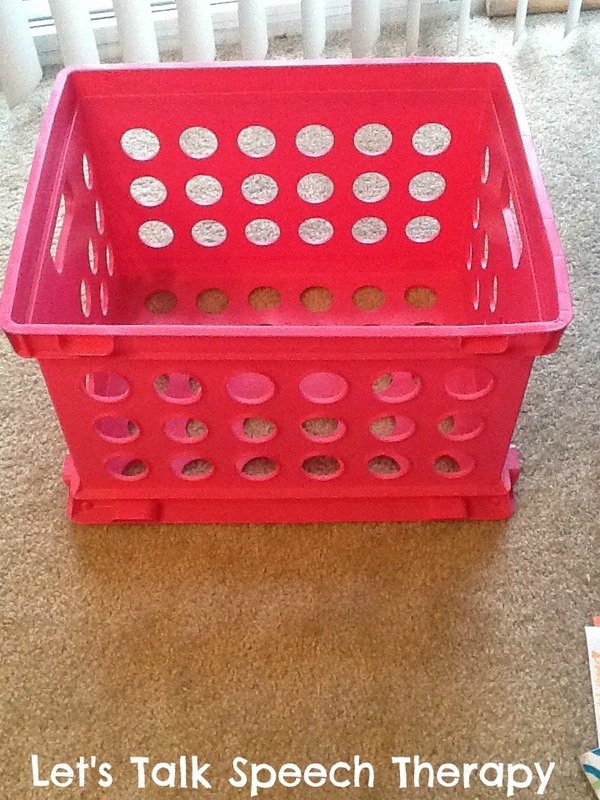 One of my “to-do”s was making the ever famous crate seats! a pink crate that has been with me for quite some time! In undergrad, a few of these made a mock bookshelf, and in my grad school apartment, they serve as a house for my shoes. 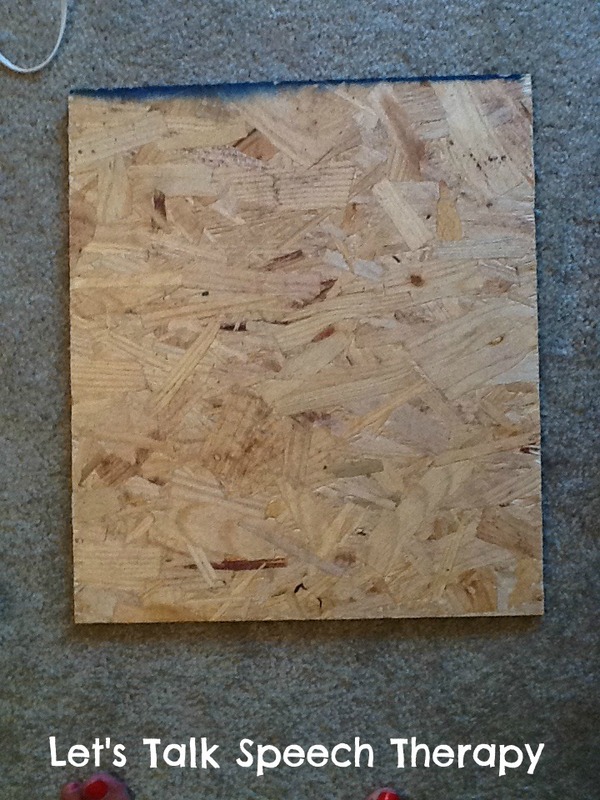 A piece of OSB (oriented strand board) from Lowe’s. I took my crate in with me for the actual size, and asked if they had a scrap laying around. OSB is cheaper than plywood, and is just the same thing. After talking to a couple people in the lumber section (trust me, my pink crate and I looked VERY out of place! ), they found a scrap big enough to cut me 4 pieces, and gave it to me for free! Otherwise, you’ll have to buy a whole sheet, but they will cut it for you at the store either way. 1. 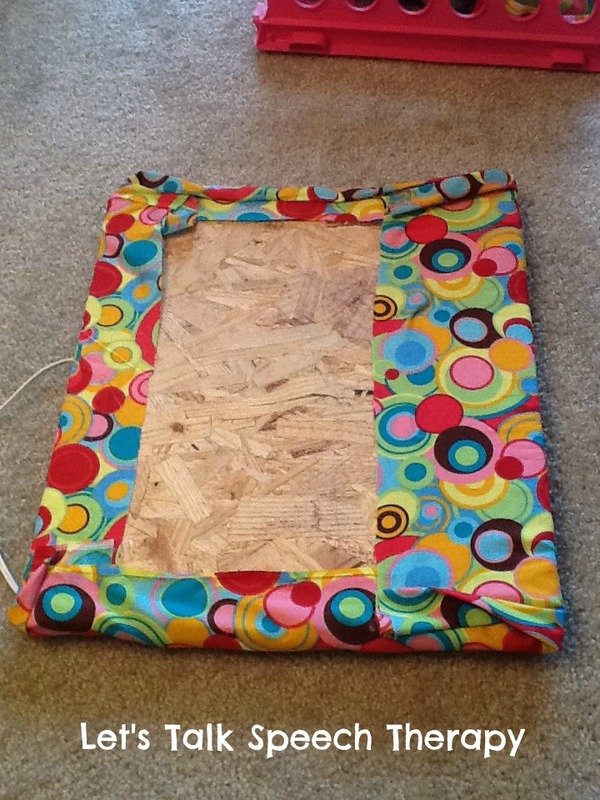 Lay out your cotton batting onto the board, adding as little or much as you want-more makes it more comfy for little bottoms to sit on! 2. 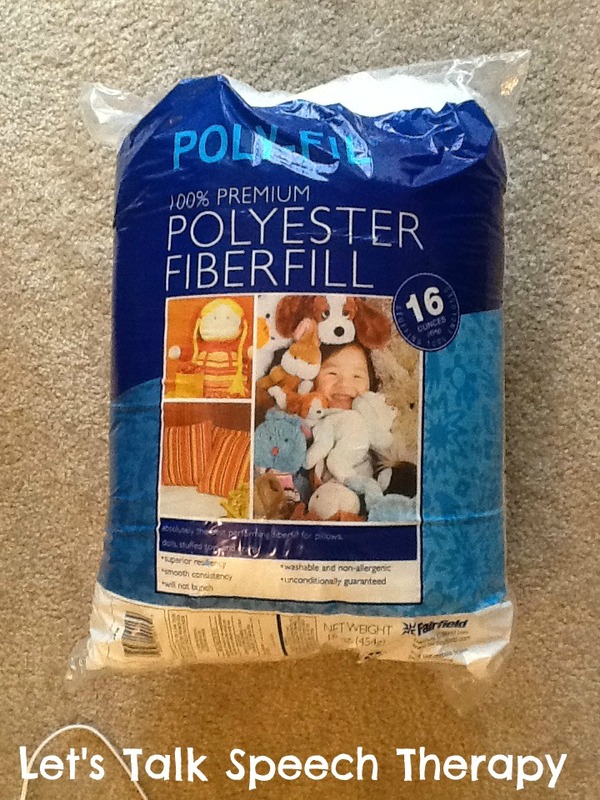 Place fabric over the pollyfill and then flip-careful not to move your pollyfill around too much! One great thing about this project-the bottom doesn’t have to be perfect…because it’s the bottom! The finished product! Most other crate seats that I’ve seen have the wood cut so it fits down inside the crate-the man at Lowe’s said it would be safer and sturdier if it hung over the edge a little, that way the pressure wasn’t all on the sides of the crate. I left my gold cord off after all,once I saw it complete I decided to leave it off. But now I have it on hand for a future project! 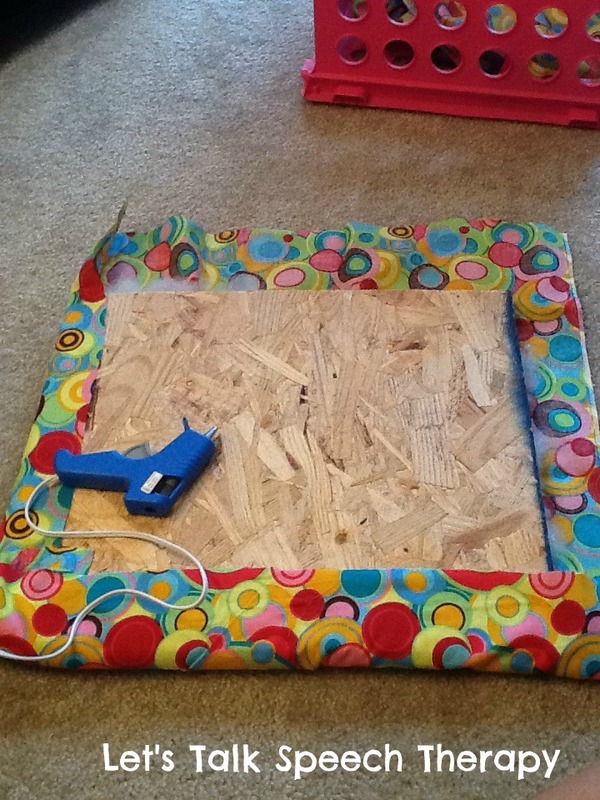 Also, next time I’ll probably scrounge up a staple gun. 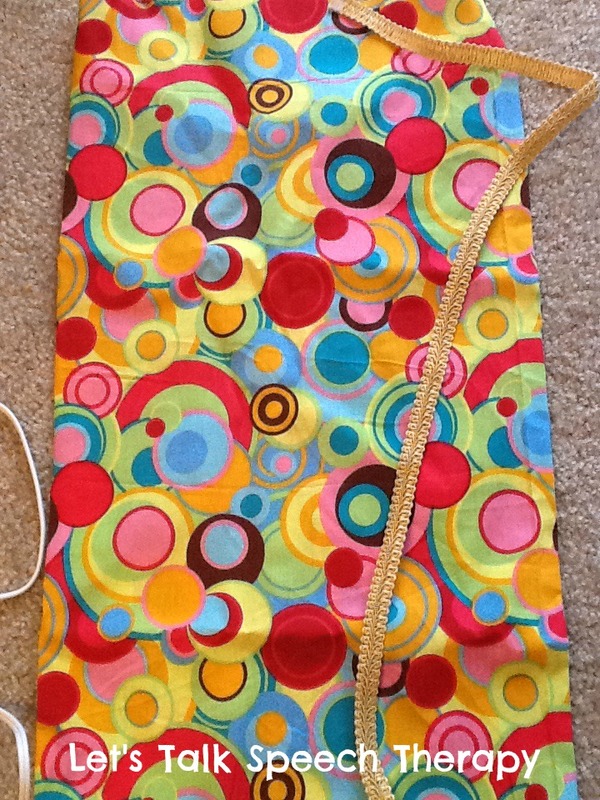 I feel like the glue gun did great, but the staple gun would probably make for a tighter fitting fabric. I love that I was able to take this, start to finish, in under 30 minutes! Working in my university’s clinic doesn’t provide for a lot of use for this, so for now it will probably act as storage. But when it comes time for my CFY, and my future job, I will make use of it often, I’m sure! I can say I’ve done it and I’ll know what I’m doing the next time I go to make more, which I know I will be. Even if I don’t end up in the schools, I feel like this will be a knee and back-saver for me, and a couple extras will bring a fun and useful element to any treatment setting! Hi all! Sorry for my absence..summer school is winding down in the next few weeks, so that means it’s crunch time.My to-do list is quite a sight. I keep thinking I need to post, so I decided to hook you up with this wonderful bingo game! I’ve loved everything Disney since I can remember and I love that I get to use it in therapy, because most of my kids do, too! 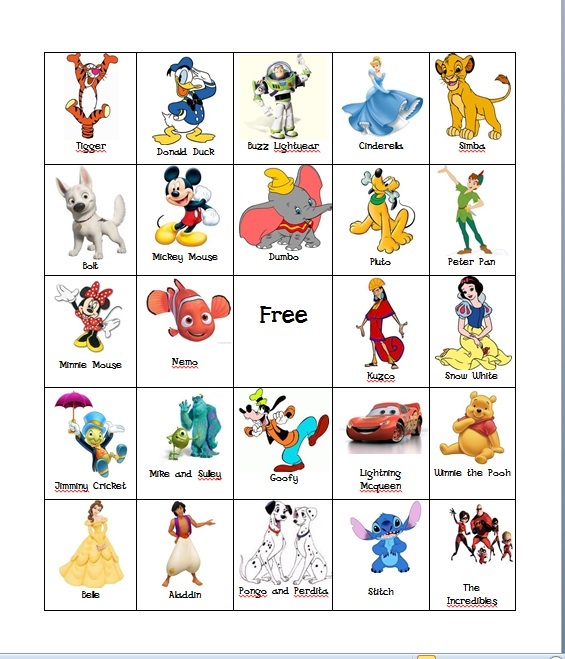 The download gives you two different bingo sheets and call pictures to cut up and use. Bingo makers will, of course, have to be from you. I’ve got some exciting posts coming…so stay tuned! Let’s face it. 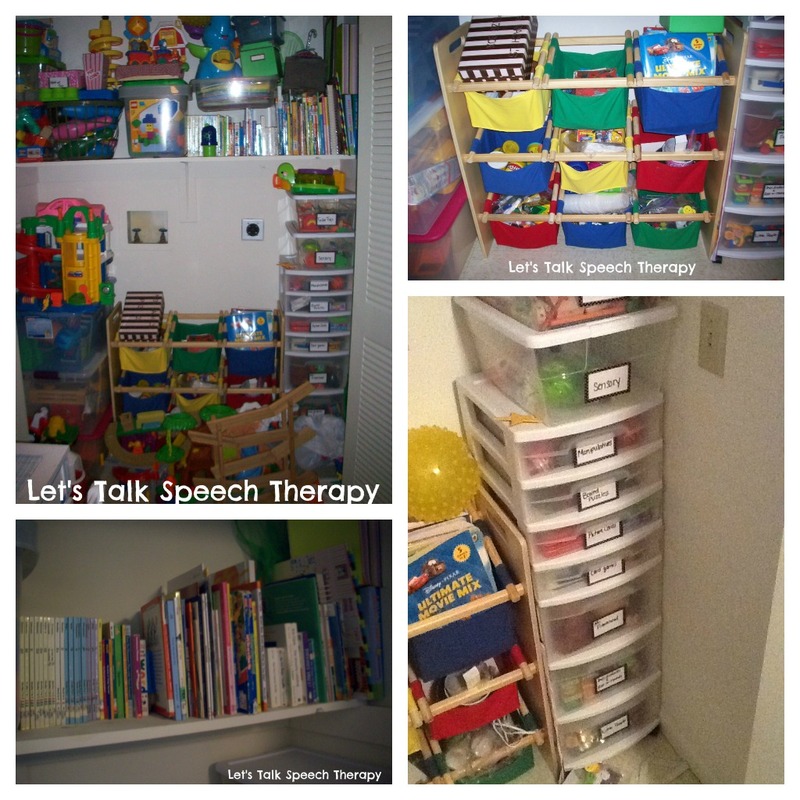 I have no idea how speech therapy happened before Pinterest. (Actually, I know those SLPs are just SUPER creative and I one day hope to be like them!) I was lucky enough to start grad school just about the same time as I discovered the big, big word of Pinterest, and it is clearly reflected in my therapy! Our clinic director even approached our class one day and said “Okay, what gives. Everyone has therapy activities that eat things! !” (think the “There Was an Old Lady Who Swallowed a ________ ” cereal box activity). I love to wander aimlessly through Pinterest in my spare time when I should be doing a million other things, and this summer is no exception! I’ve started my “to do” list for materials to make between now and the beginning of our clinic semester! Here’s what I’ve found, so far, that will be joining my already-too large collection of therapy materials. Note-none of these are my creations, I just love them. Click on the link associated with each picture to check them out! Glitter Time-out Timers-I’m thinking some of the small reusable water bottles would be a shorter time…maintaining behavior or those nasty meltdowns I’m proud to say I survived with my lower-functioning clients! Bazinga! For those times when artic OR language cards are just a must (blech!) This makes it a little more fun, while maintaining a good number of opportunities! This site is so cool! You simply select a charity, and you have access to a BUNCH of great books. The best part? It’s free! I plan on using this as much as possible! Sensory bins-I love them. All of them. Plain and simple. I also love using them for artic, language, you name it. So share and share alike…what’s on your Pinterest to-do list before the year gets going again? Classes are back in full swing for the week already, but I thought I would give you a peek into what I’m doing in my summer elective class. I’m taking “Assistive Technology” and am loving it! We’re only a week in, but I’m already learning to much about adapting and augmenting things for clients in ways not ONLY AAC -related. It’s through our Special Education department here, but I’m so thankful I decided to take it! One of our assignments was to create a PowerPoint game for our “classroom” (since it’s an education class everything is from the perspective of a teacher, but easily transferable! 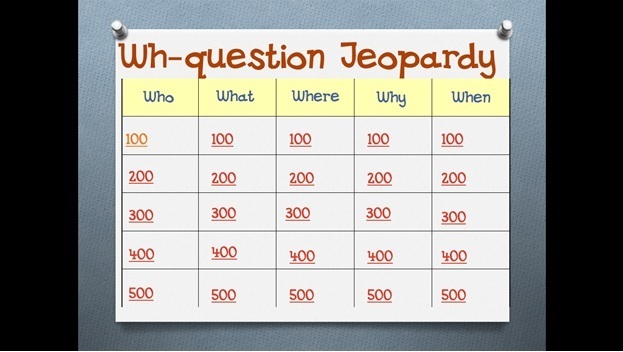 ), so I put together a “Wh-question Jeopardy” game! 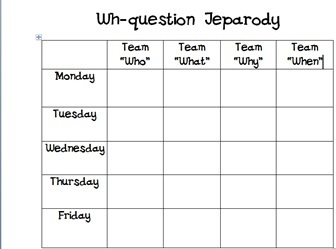 I love working with language, and with the Autism experience I’ve had, I feel like we work on Wh-questions for evvvvver! This could be easily modified for any other language concepts, or even artic words. How fun would this to play in a group over the course of a couple days? You could keep a running score over the week and have an overall winner at the end of the week. Here’s what I saw in my head when I thought of that. Of course, laminating it and using dry-erase marker to keep score will keep your score sheet useful for a long time, and help with the paper crunch! Be sure to comment if you download it! ***Note: If you are unable to download, comment below and I would be thrilled to e-mail you the direct file of whatever you’d like. Never can count on technology too much!! What kind of group interactive games like this do you like to use best? I finally decided to break down and get my own iPad this summer. I was going to wait until post-graduation and use it as a big reinforcer, but I found an opportunity I couldn’t pass up and became a proud, and excited, owner. It turns out that everyone has posted and pinned their favorite apps, along with long app reviews, and as helpful as it is, it’s a lot to weed through! My first favorite app is from Educreations, called Educretions Interacvite Whiteboard. (createive, no?!) My very favorite thing about it is that it is free!! And for this grad student, that is a major appeal. 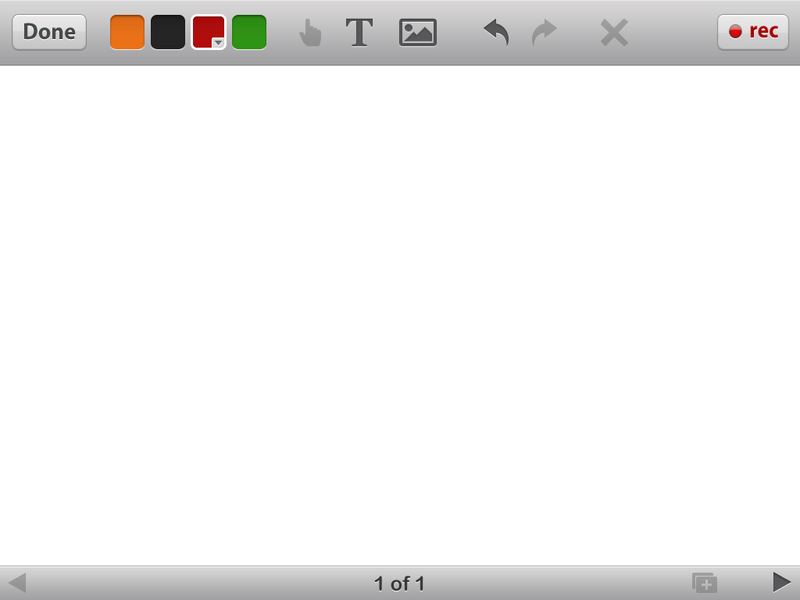 This app truly is a portable white board, and does everything that a normal white board would do, and then some! You start off with this landscape-oriented page, and the rest is up to you. 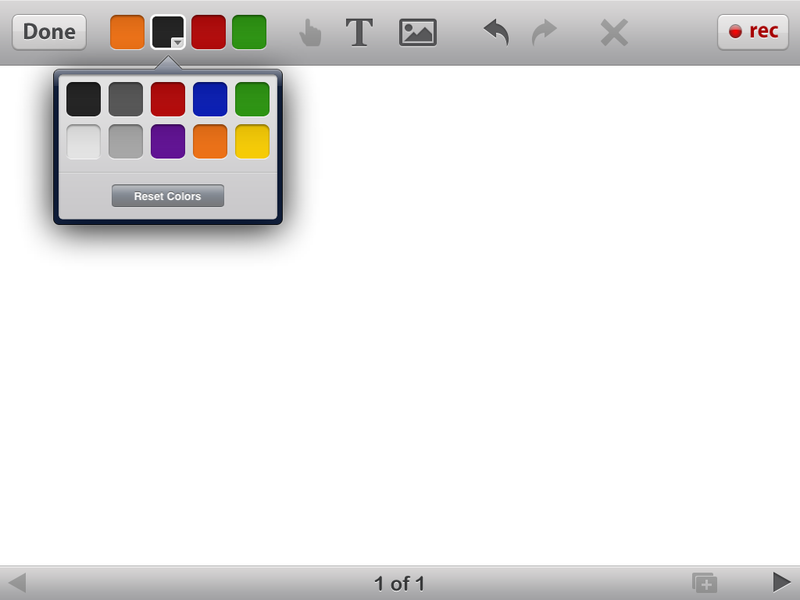 You can select a maker color from the top left, and use the drop-down arrow to select more. The 4 colors that are shown can be edited so your favorites are always at hand! The marker feature is great for lots of things-pattern completion, simple writing, drawing sequences, reinforceing “free drawing”, or even as an answer sheet during group games! 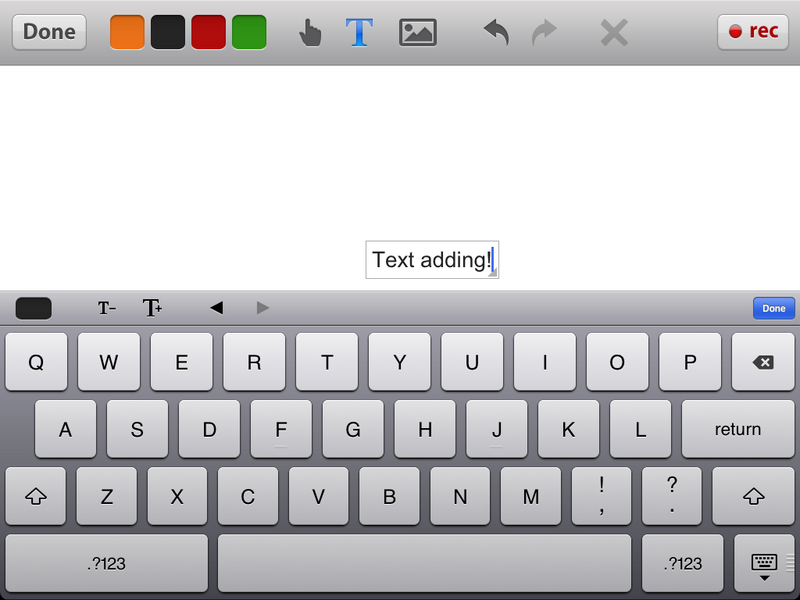 If you have a kiddo with dexterity issues, a neat typing feature is included (see the capital T in the top bar),and the keyboard appears. You can also select the color and location of your text-simply touch and move! “Lessons” can be saved and stored, so anything you create and absolutely love can be used over again without having to re-create. Let’s hear it for time-saving features! My personal favorite part of the app is the image-adding. 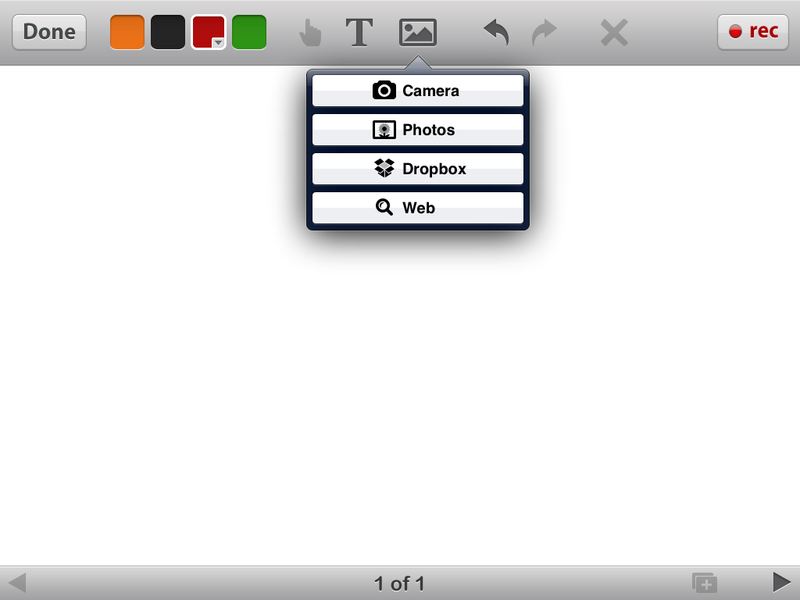 Simply select the picture icon next to the “T”, and choose where your image is located. 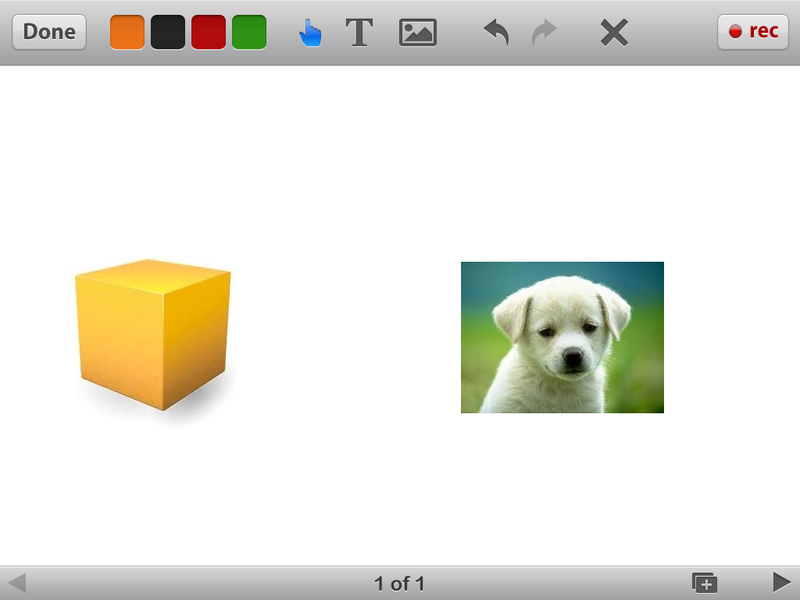 After adding your images, they can be used with the marker feature to do whatever you’d like! From simple following directions “circle the puppy” or more complex ones “Put an X on the block before you draw a cloud around the puppy. Clearly, from my art “skills”, the fish was added. When you’re finished, you can either clear the entire board, or just your markings! Last but not least, the great recording feature lets you record, or your client, narration as you draw/write, and playback is great. How many ways can THAT be used?! I know this was long, but I really love this app-it’s great in all kinds of situations and works just as well as a normal whiteboard, but no lost marker, no “children with markers” hesitations, and cleans up nicely 😉 And did I mention that it’s FREE in the iTunes store? Because it’s FREE!! 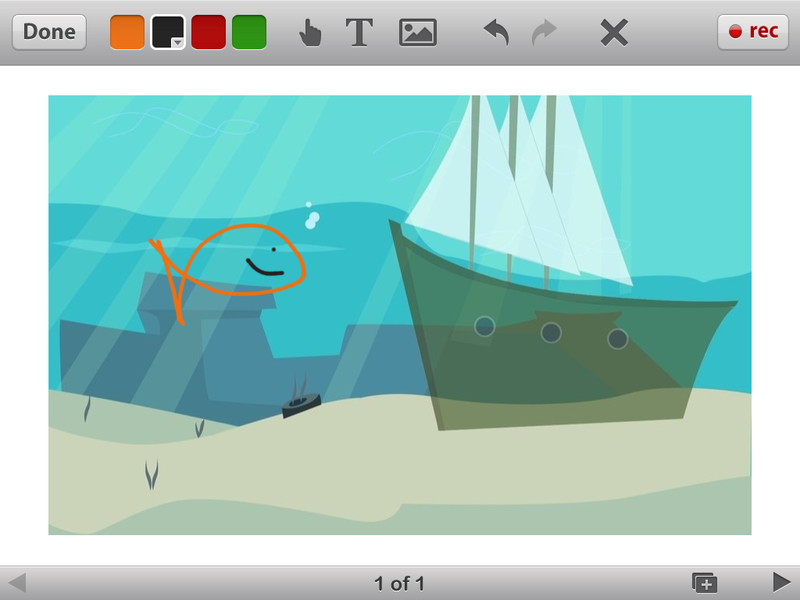 Two thumbs up all around, Educreations. How about you? Have you used this app? Where would you use it best? Any other similar apps that you’ve used and loved? So if you don’t frequently blog on ONE, why are you starting a second? I have followers who I know are not speech/education folk, and to be frank I was starting to feel like I was boring them to death with speechy things, and no one wants to be the boring one! 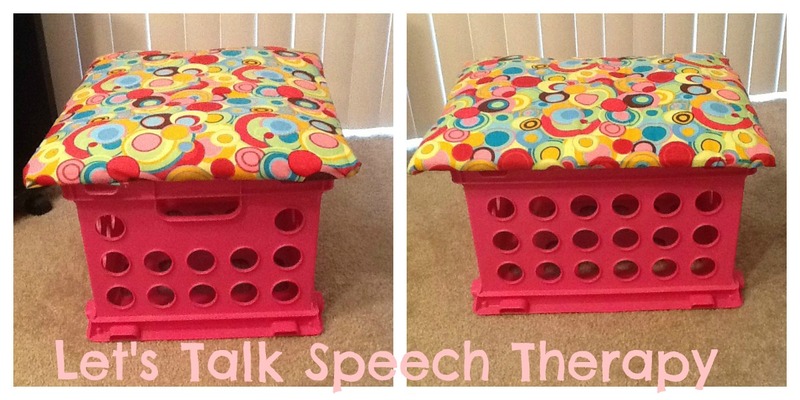 So I created this little corner of the web where I can talk about speech, post materials, etc. without hesitation. I’ll still be baking/life/friends/thoughts, but I’ll save the rest for here. Let’s get the silly introduction things out of the way so we can get down to the good stuff! I am 7 classes and 2 practicums away from being being a CFY and I absolutely can not wait. Don’t get me wrong, I love learning, but I am VERY ready to simply do what I love every day and not have to take tests or sit in class 5 days a week. I’m currently in “Summer session II” which simply means I only have 2 classes instead of 5. I love all kinds of things speech, but I have a real heart for pediatrics, and am very quickly growing my own materials room (which is currently a laundry and coat closet). I’ve done ABA therapy since my junior year in undergrad, and while I don’t subscribe to all of the principles, I have learned a lot from it, and work with one low-verbal boy when I’m not in school or clinic. I’m so glad you’ve stopped in, and I promise more exciting things, and pictures, are coming soon!